GRID's interface is very basic and can be picked up by anyone. "Multiplayer" is right on the main menu and "Single-Card Play" follows on the Multiplayer menu. The opening credits are average in length (and partially skippable). Download time also runs about average with a split download. All of the menu options are large and are well labled. There's more than enough space to tap wildly with a thumb and still hit the target option without the need for a stylus. The basic driving controls are button-based and easy to pick up. The subtleties of the car types and road conditions will take more getting used to, but that's exactly as it was intended. When switching courses in Single-Card Download play, your car is changed to match the style of race, and thus the driving conditions are changed as well. Milan (the first listed course) is best used as a starter race because winning doesn't require any advanced techniques. Donington Park Wet (the last listed course) is easily the most difficult, with a high likelihood that inexperienced drivers will slide right off the course and into the grass. Because of the vast variety in required skill levels, there's enough to provide a challenge for experienced racers while not discouraging newer racers. Graphically, GRID featues excellent 3D for a Nintendo DS game. While not perfect, the graphics are far above the average. Audibly, the sound effects fill in as a mood setter and to warn of oncoming competitors. In terms of features, there are three different tracks to select from and championships of exactly three races can be set up in any combination of races from one of each (in any order) to three times through the same course, or anywhere in between. There are no choices of cars, but the game automatically assigns an appriopriate car (based on the track type) when racing a game via Single-Card Download. 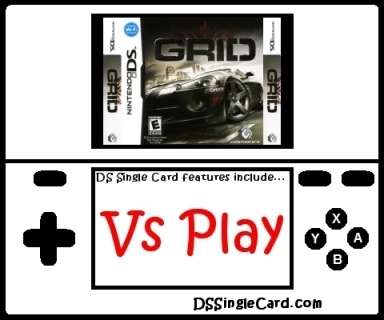 GRID is a direct sequel to Race Driver: Create & Race, one of the best racers on the Nintendo DS system family (in fact, it's officially called "Race Driver: Grid" in Europe). I immensely enjoyed the first game, and while the second game is also excellent, I had some mixed feelings. In the earlier game, championships could be set with up to fourteen races. In this game, all championships must have three races, no more and no less. In the earlier game, there were eight tracks to choose from for Single-Card Download play and eight driver/car combinations to choose from. In this game, there are three different courses available in Single-Card Download play, and each shows off different things the game is capable of (driver/car selection is unavailable as a car is automatically assigned that matches the course type). The three courses that are available, however, do a fantastic job of showing off what the main, single-player experience within the game is capable of. Of the three courses, one is standard European street racing, one is Detroit hot rod inner-city racing, and one is a proper race track in heavy rain. I enjoyed the varity of tracks and (alongside them) the variety of cars and road conditions. The Race Driver series has been utterly fantastic so far, and in my opinion, Race Driver: Create And Race edges GRID in options by very little, primarily because of variety leading to replayability. Make no mistake, though: GRID is no slouch, it's a fantastic title for serious racing gamers-on-the-go, and I highly recommend it as well, without a second thought. On a separate note, compared to the Race Driver: Create And Race... the menu system was repaired and depth perception is no longer a problem. Return the car/driver options and the ability to set up a championship of one race, fourteen races, or any number of races in between. Click here to return to the DSSingleCard.com GRID profile.